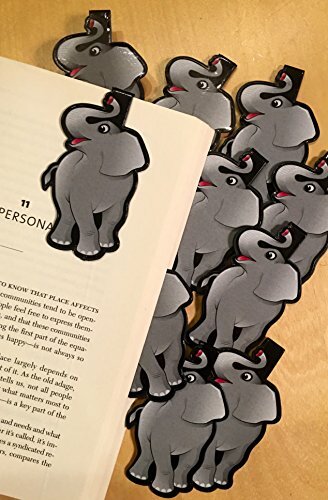 Elephant Bulk Bookmarks for Kids Girls Boys - Set of 10 - Perfect for School Student Incentives Birthday Party Supplies Reading Incentives Party Favor Prizes Classroom Reading Awards! ELEPHANT BOOKMARKS! Each 1.5" Circle plastic bookmark easily clips over the page to securely mark your place. Our bookmarks for teens, adults & kids are a sure fire way to encourage school spirit and reading! Ideal for student incentives, summer reading programs, vacation bible school awards, reading rewards, student prizes, teacher give-a-ways and classroom rewards. Can be used as a fun bookmark or a paper clip. Bulk Bookmarks make great gifts, cool birthday party favors and a little something extra for stocking stuffers! QUICK AND EASY REWARDS! It has been proven that one of the best motivators for good behavior is using incentives and rewards. Our Bookmarks make an affordable, fun, and effective reward for children! Whether at home or at school, our bookmarks work as powerful prizes for kids! Practical & educational gifts for young readers, kids, teens, boys and girls. Perfect giveaway item for your read-a-thon or story time. THE RIGHT TOOLS TO EXCEL WITH LEARNING! When kids are excited to learn and are having fun, it makes reading much more memorable. With our fun CLIP OVER THE PAGE bookmarks, they will feel rewarded by reading! THE PERFECT GIFT FOR KIDS OF ALL AGES! Who doesn't like rewarded, right?! It's almost impossible not to smile when you receive a gift for doing well! . Ideal for boy's girl's teen's children students librarian teachers! MAKE READING FUN.... Our cool bookmarks have kids actually excited to read and use them to mark their spot! WIDE RANGE OF USES: Check out all of our other cute adorable animal bookmarks at our storefront - Bee Ladybug Dragonfly Butterfly Frog Lizard Bookworm Alligator Sea Turtle Dolphin Seahorse Octopus Bear Panda Monkey Penguin Bookmarks. Bookmarks can increase children's interest in reading and can be fun gifts for children & students. Motivational bookmarks, quote bookmarks, inspirational bookmarks, summer reading program bookmarks and many more. ELEPHANT BOOKMARKS! Each 1.5" plastic bookmark easily clips over the page to securely mark your place. Our bookmarks for kids are a sure fire way to encourage school spirit and reading! Ideal for student incentives, reading rewards, student prizes, teacher give-a-ways and classroom rewards. Can be used as a fun bookmark or a paper clip. Bulk Bookmarks make great gifts, cool birthday party favors and a little something extra for stocking stuffers! QUICK AND EASY REWARDS! It has been proven that one of the best motivators for good behavior is using incentives and rewards. Our Bookmarks make an affordable, fun, and effective reward for children! Whether at home or at school, our bookmarks work as powerful prizes for kids! Practical & educational gifts for young readers, kids, teens, boys and girls. Perfect giveaway item for your read-a-thon or story time. THE PERFECT GIFT FOR KIDS OF ALL AGES! Who doesn't like rewarded, right?! It's almost impossible not to smile when you receive a gift for doing well! . Ideal for boys girls teens children students librarian teachers! THE RIGHT TOOLS TO EXCEL WITH LEARNING! When kids are excited to learn and are having fun, it makes reading much more memorable. With our fun CLIP OVER THE PAGE bookmarks, they will feel rewarded by reading! Encourage reading!MAKE READING FUN.... Our cool bookmarks have kids actually excited to read and use them to mark their spot! WIDE RANGE OF USES: Check out all of our other cute adorable animal bookmarks at our storefront - Bee Ladybug Dragonfly Butterfly Frog Lizard Bookworm Alligator Sea Turtle Dolphin Seahorse Octopus Bear Panda Monkey Penguin Bookmarks. Motivational bookmarks, quote bookmarks, inspirational bookmarks, summer reading program bookmarks and many more. Bookmarks can increase children's interest in reading and can be fun gifts to children, students. If you have any questions about this product by Reading Rewards, contact us by completing and submitting the form below. If you are looking for a specif part number, please include it with your message. Emoticon"Clip over the Page" Bookmarks - 36 Bulk Bookmarks for Kids girl’s boys- School Student Incentives – Library incentives – Reading Incentives - Party Favor Prizes - Classroom Reading Awards! I LOVE MY LIBRARY Bookmarks - 36 Bulk Bookmarks for Kids girl’s boys- School Student Incentives – Library incentives – Reading Incentives - Party Favor Prizes - Classroom Reading Awards! I LOVE MY LIBRARY Bookmarks - 36 Bulk Bookmarks for Kids girl’s boys - School Student Incentives – Library incentives – Reading Incentives - Party Favor Prizes - Classroom Reading Awards! I Love Mustaches Bookmarks - 36 Bulk Bookmarks for Kids girl’s boys- School Student Incentives – Library incentives – Reading Incentives - Party Favor Prizes - Classroom Reading Awards! TRENDY & FUN Bookmarks - 36 Bulk Bookmarks for Kids girl’s boys- School Student Incentives – Library incentives – Reading Incentives - Party Favor Prizes - Classroom Reading Awards!